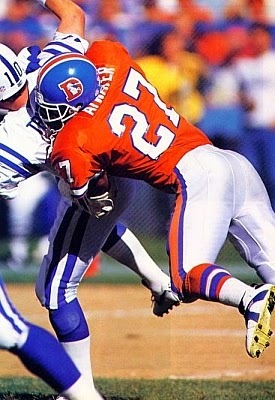 Atwater was chosen by the Broncos in the first round of the 1989 NFL draft (20th overall) and moved directly into the starting lineup at free safety. Playing with poise and having good range and size, he teamed well with veteran SS Dennis Smith. He followed up with a 1990 season in which he received his first Pro Bowl selection as well as being named second-team All-NFL by NEA and All-AFC by UPI and Pro Football Weekly. Broncos went 12-4 to finish first in the AFC West while leading conference in sacks (52), interceptions (23, tied with Buffalo), fewest yards allowed (4549), fewest passing yards allowed (2755), and fewest points allowed (235). Won AFC Divisional playoff over Houston Oilers (26-24). Lost AFC Championship to Buffalo Bills (10-7). Atwater was again a consensus first-team All-NFL choice in 1992 and also gained Pro Bowl honors for the third of seven straight seasons. He was shifted to strong safety in ’94 but moved back to free safety in 1995. While no longer as dominating as during his peak years, Atwater remained a formidable player with his physicality. Shoulder problems hindered his performance in 1997, ending his Pro Bowl string, but he remained an important contributor as the team won the Super Bowl, a contest in which he distinguished himself. Atwater was removed during passing situations in ’98, his last year with Denver, although he gained Pro Bowl honors once more, his eighth overall selection. The club repeated as NFL Champion and Atwater departed, playing one last season with the New York Jets in 1999 before retiring. In the course of 11 seasons, Atwater, in addition to his Pro Bowl selections, was twice a consensus first-team All-NFL choice and received second-team All-NFL and/or All-AFC honors after four other years. He intercepted 24 passes (all with the Broncos), one of which he returned for a TD, and was credited with over a thousand tackles.